New: Equipment, Boosts, Recommendations, Average Scores and Zong! Today's new features include new equipment in the Pro Shop, XP Boosts, Recommendations for XP, improved Average Score formula and Zong for mobile payments. WGT Tour PLUS Clubs – A new brand of golf clubs designed for newer players who want the advantages of top equipment without having to wait until a higher level in the game. See the clubs! WGT Pro Clubs – A new set of golf clubs designed for players in the Pro tier with all the features to help them compete and move more quickly to Tour Pro and Master. See the clubs! WGT Legend Balls – Based on player feedback, we’ve reduced the price of the recent Legend GI-SD2 balls by 15% and added it in all colors and with a Vapor Trail. We’ve also added the new Legend GI2-SD2 with the same performance benefits plus a slower swing meter. See the balls! TaylorMade Ghost Putter – Our new top putter isn’t unlocked until Level 84, as a reward to our most dedicated players. This beauty from TaylorMade has a unique all-white clubhead and an innovative design for unparalleled putting precision. See the putter! Special Edition Halloween Ball – A little fun for our US players, a special Halloween ball in orange with a ghostly magenta Vapor Trail. Based on our popular Vapor Trail balls and available for the next week only—a fun collector’s item! See the balls! We’ve added virtual Snacks to our Pro Shop! Our new XP Boost Drinks help you earn Experience Points (XP) faster so you can level-up more quickly and unlock more equipment upgrades. Buy one for yourself or gift one to a friend. Look for more snacks and boosts coming soon! Buy one or gift one to a friend today! We’ve improved our WGT Recommends options in the main Game Menu to help you explore the game. And now you can earn more Experience Points (XP) by following the recommendations, to help you level-up faster and unlock more equipment upgrades. Visit the Buy Credits page to use Zong to purchase credits! Buy Credits Now! We’ve made improvements to how your Average Score is calculated and when you advance to the next Tier in WGT. These changes will help players in the same Tier to compete more fairly, and encourage everyone to complete more rounds and earn more experience points so they reach new Levels faster. What a Ryder Cup! The first Monday finish in the history of the biennial team matches turned into probably one of the most exciting in history. Of course, this was also the first one I’d watched from start to finish, but from what I’ve heard from several colleagues that have attended many, it’s definitely up there. I was blogging over at the WSJ.com (go here to see all the jargon I spewed) and in my last post I sounded very pessimistic even though Rickie Fowler had started his run. The Americans fought hard and almost staged an unbelievable comeback rivaling Brookline in ’99, but it wasn’t enough to overcome the three-point deficit after the thrashing on Sunday afternoon. Still, the Americans, who have long been criticized for “not caring,” showed their heart and proved the naysayers wrong. Just an hour or two earlier, it looked like it was going to be over before most people made it to work on the East Coast. Fowler staged a phenomenal comeback against Edoardo Molinari. Down three with four to play, the 21-year-old American made four consecutive birdies and won the last three holes to halve the match. Fowler drained a 15-footer on 17 to force the match to 18. And then with Molinari safely in the cup for par on 18, Fowler was faced with one of those 20-footers for birdie to win the hole and the crucial half point for the Americans. With Phil Mickelson defeating Peter Hanson and Zach Johnson besting Padraig Harrington — and then Fowler’s half point — suddenly, the Americans had pulled to even with Europe at 13 1/2 points apiece. 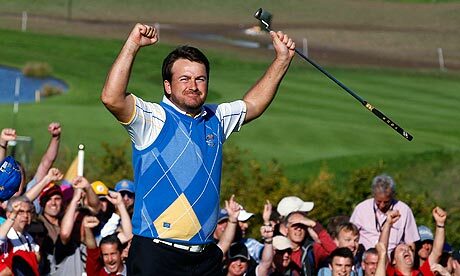 Pardon the cliche reference, but to steal a line out of the movie Tin Cup, “When a defining moment comes along, you define the moment… or the moment defines you.” Despite the nerves and immense pressure, Fowler sank the clutch putt that forced the Ryder Cup to the last match on the course, between Hunter Mahan and Graeme McDowell. McDowell, the reigning US Open champion, looked to be relishing the opportunity to take center stage and controlled the match for its duration. Meanwhile, Mahan struggled to find his rhythm. It was just one of those days that the putts weren’t dropping. Two down with four to play, Mahan made his first birdie of the day on 15 to cut McDowell’s lead to one-up with three to play. But McDowell came up huge with a birdie on 16. Mahan needed magic on 17 to extend the match, but his tee shot on the par-3 17 came up short, while McDowell was safely on the green. With the weight of the Ryder Cup on his shoulders, Mahan had to chip in, but unfortunately, nerves got to the best of him and he duffed it. That one may hurt for a while, but it wasn’t his fault the team lost (though I’m sure he feels differently). It was a valiant effort by Mahan and the rest of the US squad. Had Mahan not put up a fight, McDowell could have routed him on the 14th hole and the result would have been the same. And then he rambled on before breaking down in tears. It was disheartening to watch (I even started tearing up). A passionate Stewart Cink eloquently made a great point. “If you go up and down the line of the tour players in Europe and the U.S. and asked them if they would like to be the last guy to decide the Ryder Cup, probably less than half would say they would like to be that guy and probably less than 10 percent of them would mean it,” Cink said. And not to get all cheesy, but these emotional responses only come out of the Ryder Cup — just like the incredible shots that players pull off. It was a winning moment to see Mahan’s teammates back him up. Even Tiger seemed emotional — well, more than we usually see from him. The Americans put up a great fight, not to mention bigger than expected, but in the end, it wasn’t enough to thwart Europe’s passionate effort, particularly the Sunday afternoon thrashing. Congrats on a fantastic win, Europe. See you in two years.